When wine pros evaluate a bottle, they focus on six key things. 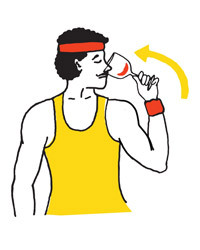 Here, F&W’s Megan Krigbaum collects exercises from a trio of experts to help even a wine know-nothing become a smarter, happier, more insightful taster. What Defines Body In Wine? “Body is the sense of weight or richness or heaviness, and even the feeling of viscosity that a wine leaves in your mouth,” says Master Sommelier Andrea Robinson, author of Great Wine Made Simple. Generally, the more alcohol in a wine, the more body it will have, which means that wines from warmer climates (which produce grapes with more sugar to be converted into alcohol) tend to have more heft. Sugar, oak and the overall concentration of flavors in a wine can also add body. How Does Body Affect Pairing? 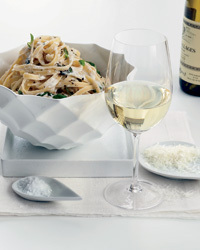 “A key principle for pairing is to match body with body, so that the wine’s not too heavy or light for the dish, and vice versa,” says Robinson. “Wines have different weights and richnesses, mostly due to alcohol. Milk can vary in the same way, but of course that’s due to fat,” says Robinson. Taste the milk in ascending order of richness, beginning with skim and ending with heavy cream, considering the texture of each and the sensation in your mouth. The skim milk should dissipate very quickly; the cream will coat your tongue. Tannins are compounds in grape skins, seeds and stems that contribute to wine’s structure, complexity, texture and ageability—especially red wine. Tannins create a drying and slightly bitter sensation in the mouth, usually toward the back of the tongue. Tannic wines pair especially well with rich foods and substantial meat dishes because they cut through fat; fat also softens the perception of tannin, making the wines more approachable. Pour 8 ounces of hot water into each of the mugs. Place one tea bag in each of the mugs and start a timer. After 2 minutes, remove the bag from the first mug; after 4 minutes, remove the bag from the second mug; and after 8 minutes, remove the final tea bag. Let the tea cool. Taste the teas in increasing steep-time order, swishing the liquid around in your mouth before swallowing. Notice how the teas are perceptibly more astringent as the steeping time increases. What is Acidity in Wine? Acidity in wine comes from the natural acids (tartaric, malic, etc.) in the grapes themselves, or acids that are added during the the winemaking process. The acidity in grapes varies greatly depending on the variety, as well as sun exposure, climate and the soil in the vineyard; grapes grown in cooler areas tend to have higher acidity. When drinking a wine, you’ll feel the effects of acidity mostly on the sides of your tongue. Overly acidic wines will cause almost a stinging sensation or taste sour. How Does Acidity Affect Pairing? Acidity makes your mouth water, cuts through the fat in rich foods and refreshes the palate. Set aside the first glass of water. Squeeze the juice of 1/4 orange into the second glass; into the third, squeeze the juice of 1/4 grapefruit; into the fourth, squeeze the juice of 1/2 lemon; into the fifth, squeeze the juice of 1/2 lime. Taste in that order, starting with a sip of plain water, to experience increasing levels of acidity. 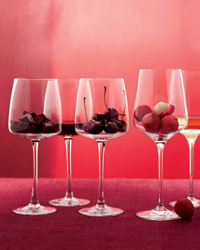 Experiment by adding more juice to each glass to see how the acidity increases. Notice the point at which the juice becomes too sour. What is Sweetness in Wine, and Why Does it Matter? Sweetness in wine is measured by the amount of residual sugar (RS) in the liquid after fermentation. “Sweetness can only come from one thing in wine, and that’s sugar content,” says Master Sommelier Shayn Bjornholm. Acidity can mask some of the sweetness in wines by balancing out the sugar, as in German or Alsatian Riesling. Sugar can also contribute to a wine’s body and texture. Squeeze the juice of the lemons into the water and stir. Taste the mixture; it will be very tart. Stir in sugar 1 teaspoon at a time, tasting after each addition. You should notice when the juice achieves the right level of sweetness and balances the acidity of the lemon. 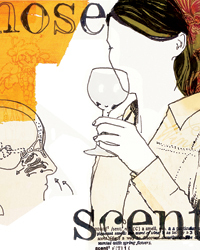 What Accounts for a Wine’s Aromas and Flavors? A wine’s flavors come from the grape variety, as well as the climate and the amount of sun exposure and type of soil in the vineyard. Different winemaking techniques will extract various flavors, too. What’s The Best Way to Describe a Wine’s Flavors and Aromas? 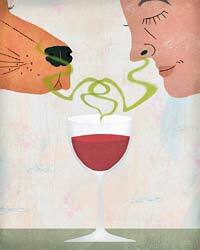 The truth is, everyone smells and tastes different aromas and flavors in wine. It’s a very subjective judgement. That said, the more tasting experiences you have, the more easily you’ll be able to pick out those flavors. Having your own flavor vocabulary can come in handy when ordering wine from a sommelier or talking with a salesperson at a wine shop—and, most importantly, when pairing wines with food. 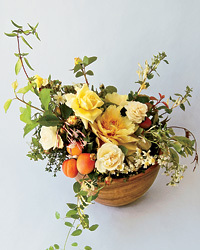 Put on the blindfold and have someone set out the aromatic items in front of you in any order. Smell each item. “Aroma accounts for the majority of our taste, anyway,” says Bjornholm. Not only will this exercise give you a better idea of what you like, but it will also increase your Rolodex of flavors to have on hand when tasting. What does it mean for a wine to be oaked? Oak barrels used in winemaking develop their toasty, caramelly, vanilla flavors from being fire-charred. The barrels can be toasted to different levels, depending on the winemaker’s preference; those barrels can hold wine while it ferments or while it ages. Some producers favor old oak over new oak because its effect on a wine’s flavor, tannins and structure is more subtle. Crush up Cheerios and smell them. According to Joshua Wesson, the toasty, wheaty notes of the cereal are very similar to those in oaked white wine. Skewer a marshmallow and roast it over a flame on a gas stove until it’s charred. “In red wines, oak leaves the impression of campfire smoke or the smell of a burnt marshmallow,” Wesson says.